» Western Review: GILES A. LUTZ – Relentless Gun. Western Review: GILES A. LUTZ – Relentless Gun. 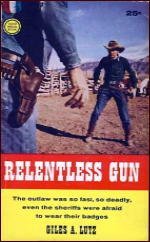 GILES A. LUTZ – Relentless Gun. Gold Medal 804, paperback original; 1st printing, September 1958. Numerous later printings. This may be the first of his “own work” that I may have read, and I enjoyed it. There is something about writing for the old pulp magazines that makes itself known right away – I can’t describe it exactly – but it has something to do with flavor and authenticity. Older western writers lived much closer to the time of the traditional western they wrote about. They grew up in it and took the life of the Old West much more for granted. Today’s western authors are excellent writers, but they’re writing about the past – a past they’re trying to recreate for readers also living in the present, far removed from the time the action of their novels is taking place. I hope I am making some sense of this, but whether I am or not, it’s an idea I hope to return to some day, once I’ve made my thoughts on the matter more solid than they are right now. And in any case, I was right. Once I started the book, I know Lutz had to have written for the pulps, and he did. As recorded to date in the Fiction Mags Index, he seems to have written only sports stories between 1939 and 1943. The first work western pulp fiction he did that’s currently listed there is “Square in the Saddle” a short story that appeared in Street & Smith’s Western Story, July 1945. As the pulps began to die out, Lutz turned to writing full length novels. The first of these, as far as I’ve been able to discover, was Fight or Run (Popular Library, 1954). From that point on, he was prolific enough to be worth doing a complete bibliography for, and maybe I will someday. Whether Relentless Gun was typical of his work, I can’t presently say, but it’s the one I just read. Dave Enders is the hero in this one, a guy who works for the law but doesn’t necessarily hang around in any one spot for very long. He’s heading for Tucson at the beginning of this one, to help out the sheriff there who needs his help in tracking down Miguel Blanco, a Mexican who’s the head of a gang wreaking havoc on the town. It turns out that the Blanco’s brother was the innocent victim of a lynching mob, and he is targeting members of the mob only for revenge – making him not entirely the total outlaw the townspeople think he is. Nor is Enders himself a man without faults. He’s a man with his own strengths and weaknesses, which he realizes, and which Lutz makes the reader realize too. There is one other complication – well, there are several, even though the book is only 144 pages long. But the one I’ll tell you about is the presence of Kate Lykens in town, a woman Enders has loved and lost before. She’s now the singer in the bar owned by Amos Busby, a man with wealth and some power in town, and you knew before I say anything more that the two men are not destined to be friends, didn’t you? Surprisingly enough there is some detective work to be done, and Enders is up to that job too, as well as tracking Miguel Blanco down. There is also a lot of action in the same amount of pages, and some surprisingly brutal deaths. There is also not a lot of wasted wordage; the story itself is a lean and sometimes mean one. It wasn’t the Spur Award winner for that year, nor was it probably even in the running, but it’s a solid piece of work. I’ve noticed the same thing about western pulp fiction. Many of the authors either remembered the old west days or had parents who related stories about the west, indians, outlaws, cowboy life, etc. Walt Colburn was called “The cowboy author” for a reason. He, like many of the western writers, was brought up among real life cowboys. In the 1920’s through the 1940’s, it was still possible to feel the west was different from the rest of the country. No longer, what with strip malls, chain stores, not to mention TV and the internet bringing us all together into one sort of lump culture that feels the same no matter where you live. Sure, there are some writers who never really lived out west and did not know a hell of alot about cattle, horses, cowboys, or ranch life. Max Brand for instance is one of the most famous examples. But he earned his living in the “pulp culture” and picked up alot of the tricks of the trade like concentrating on the story and plot, and developing a hard driving, no nonsense, style of writing encouraged by the editors. The rest of the literary world often sneered at the pulps but at its best the fiction could grab hold of you and not let go. Raymond Chandler, among many authors, noticed this and that’s why he learned his craft writing for the pulp magazines. Giles Lutz is another. But the days are gone when the newstands groaned under the weight of hundreds of fiction magazines, slick and pulp. Now there are just five major fiction magazines left: ASIMOV’S SF, ANALOG, F&SF, ELLERY QUEEN, ALFRED HITCHCOCK. All digests with very low and decreasing circulations. I think you’re onto something in that 3rd paragraph, Steve. I think the same thing is true of the early western movies into the ’30s at least. You’ve said what I was trying to say, and better! Since I count you as one of today’s western authors, I’m glad to hear that what I said, I said correctly. I did my best to make sure I was not putting down present day writers in any way. The ones I read and collect are doing a great job in keeping one branch of popular fiction alive — the western novel — and in today’s market that isn’t easy. PS. In case you are wondering, I’m the one who made the change in your first comment that your second one pointed out. Thanks for the change. Now I don’t feel quite so senile. You should see the things I do on this blog that I clean up later. Or maybe I should make that: you shouldn’t. I am the one in the photo on the front of the book. the picture was taken at Corales, NM in 1955. The person with back to camera is my father. A great story, Red. Thanks for stopping by!